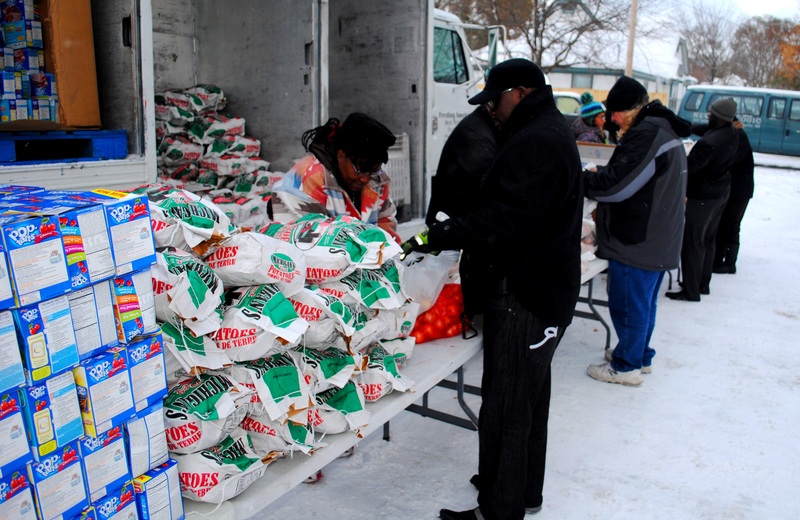 GRAND RAPIDS November 21, 2014— No one expects 18 inches of snow on the ground and sub-freezing temps the week before Thanksgiving, but even with uncooperative weather, dozens of union volunteers gathered in the parking lot of New Life Church of God in Christ in Grand Rapids to distribute food from a mobile food pantry to local residents in need. The Kent-Ionia Labor Council (KICLC) November food truck went on as scheduled on November 20, and 132 local families were able to pick up food items—including potatoes, cabbage, apples, yogurt, cakes and bread—to stock their kitchens just in time for Thanksgiving. State of Michigan employees represented by UAW Local 6000 donated fruit and nuts. UAW Local 19 and Regio n 1D generously donated over 90 turkeys. Every month, the KICLC’s affiliate unions donate their time and money to help reach local communities that need a helping hand. Most months, that means the KICLC partners with a west Michigan church to bring a Feeding America food truck out to serve residents in their neighborhoods. To date, the KICLC has helped distribute more than 30 tons of food. This entry was posted on November 21, 2014 by WMALC in Community service news and tagged church, Feeding America, Grand Rapids, UAW.